However, the main reason to watch them was that their newscast led into the Tonight Show. Johnny Carson was to American television what Neil Armstrong was to the Space program. . .the LEADER! When he retired in the early 1990’s, someone made a comment to him about how many generations of viewers were ‘raised’ on the Tonight Show. It had to be an incredible number. Brothers, sisters, cousins–we all wanted to see who was going to be on and especially, how good was his monologue going to be? Was he going to play ‘Stump The Band’ or ‘Carnac The Magnificent’ or ‘Floyd R. Turbo’? His writers–were superb. His delivery–was almost always spot on. He was the consummate professional, and to this day is remembered as such. What caused us to think about the Tonight Show and more specifically, Johnny Carson was his entrance. When Ed McMahon uttered the immortal words, “Heeeere’s Johnny!”, the audience went crazy, the music from Doc Severinsen was playing loudly, a curtain was pulled back by an invisible stagehand and out walked Johnny. Ahhh, the anticipation of that night’s jokes—one could hardly wait for the band to finish playing. . .the audience to settle down. . .and Ed McMahon bowing to Mr. Carson. But, in all of the excitement, one thing became a constant over the years. . .one thing made sure that ALL was right with the show and that the star knew EXACTLY where to go! YEP, Johnny walked to the SAME ‘X’ on the floor of the studio every single night. You could even see the spot before he walked to it during his introduction. OH BABY, when Johnny walked to the ‘X’, all was good and we were in for some great comedy. 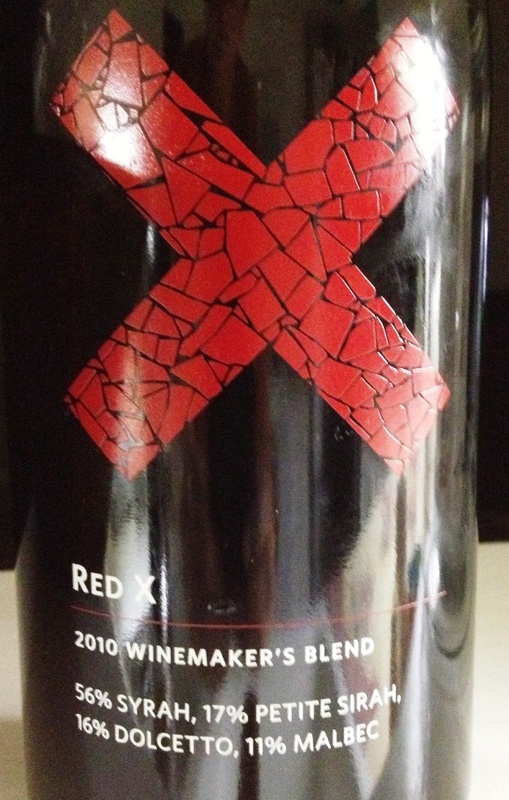 Tonight we opened a bottle of Red ‘X’ that we found at Central Market South in Austin this past weekend. Normally a $16 bottle of wine, it was marked at $15 plus we secured a 10% discount so our final cost was $13.50; we were blown away by this wine. A blend of 56% Syrah, 17% Petite Sirah, 16% Dolcetto and 11% Malbec, from X Winery in Napa, California. The wine maker’s intent is to create unique wines without the ‘stuffiness’ of corporate or over-hyped wines. “The most obvious question with respect to X Winery and proprietor Reed Renaudin is how can these wines be this good at these prices? Everyone is looking for good values today, and here are some exceptional bargains” – Robert Parker, The Wine Advocate. Yep, that is exactly how we felt about it. An amazing nose upon opening offered up loads of dark fruit, soft tannins and a certain sweetness that we didn’t expect. Was it maraschino cherries? Or was it a sweet liqueur? The longer the wine stayed open-the more subtle and complete the wine became. We found ourselves looking at the bottle for clues as to why it was so delicious. You have to appreciate a wine maker that throws the rules out and sets out to make wines that people actually enjoy drinking. . .well, that’s Red ‘X’ and we are now among their biggest fans. In addition to Red ‘X’, the winery makes a White ‘X’ blend as well as wines under the “Amicus” label including their 2011 Syrah that is rated at 92 points. It tells us that, yes, indeed, ‘X’ marks the spot, and in the case of wine maker, Reed Renaudin, he has created a terrific option for those of us who love blends but don’t like to spend a lot of cash. We think you’ll be hooked on this one as well. Just like when Johnny Carson used to find his ‘X’ on the studio floor before beginning his monologue, X Winery has found its’ ‘X’ with great wines sourced from amazing vineyards all over California. We’re ready for more! And, as Monday gives way to Tuesday, please remember to enjoy your favorite wine responsibly and recycle whenever possible. Categories: Uncategorized | Tags: CEntral Market, Doc Severinsen, Ed McMahon, Johnny Carson, KHOU, KPRC, KTRK, Red 'X' Wine, Reed Renaudin, The Tonight Show, X Winery | Permalink.